KCWCD has connected lines, drilled wells and built storage facilities to improve irrigation capacity within Kane County. A 450 gallon per minute well was drilled into the Alluvium aquifer north of Kanab to increase the water supply in the summer as well as provide added pressures in the upper zones of Kanab’s irrigation system. In 2011, the District replaced 8 miles of 50 year old cast iron pipe with a 24-inch PVC pipeline to supply Kanab City. 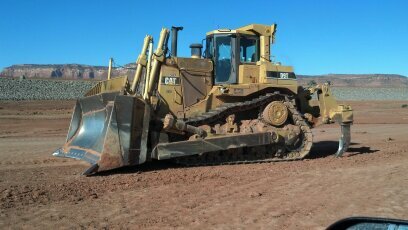 The project also included a line extension to the Ranchos subdivision south of Kanab to increase flow & capacity. After 15 years of planning, and 19 months of construction, head-gates to fill the Jackson Flat Reservoir were opened in spring 2012. The Dam structure is composed of 800,000 yards of carefully sampled and tested clay, dirt, and rock. The project was supervised by four engineering firms including the Utah State Engineer of Dam Safety, and the Army Corps of Engineers. The 4,228 acre-feet reservoir is an off stream site fed by a 24 inch pipe capable of flowing just shy of 24 acre feet per day. The average depth of the reservoir is 28 feet with a conservation pool that will sustain a 400 acre-foot pool of water. This additional secondary water source could also be used to meet other outdoor public needs such as the golf course, parks, and schools. 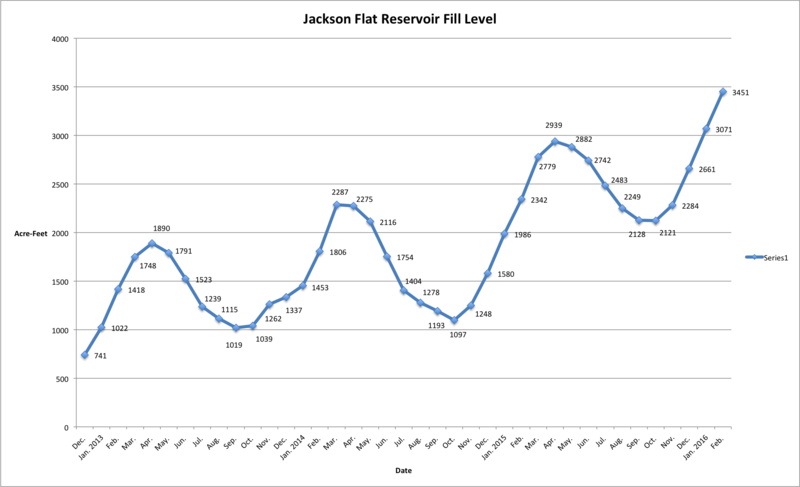 Below is a chart demonstrating the fill level at the Jackson Flat Reservoir from month to month. The water level is measured on a weekly basis. The chart shows a figure for each month which is an average of the fill levels for that month. click on the image for a larger view of the chart. The reservoir has been planted with 7,000 fish. There’s catfish, rainbow trout and bluegill in the reservoir. At this time fishing is limited to the west and southern areas of the reservoir. There is still ongoing archeology work being performed on the north and eastern areas. 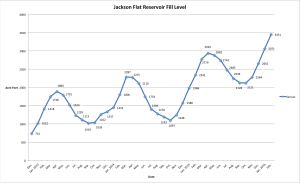 Fishing licenses are required to fish at the Jackson Flat Reservoir. Motorized boats are not allowed on the reservoir until there is a boating plan in place. Also, be respectful to the land and keep all driving to already existing roads. There are no lifeguards or anyone on site to help in case of an emergency. Swim at your own risk.